Tri-ing to be Athletic: Welcome to Sit 'n Spin Sundays! Welcome to Sit 'n Spin Sundays! pretty much leaving swimming and biking for Sundays. We like to hit the pool first. and swimming downhill... Uh, say what now? Yes, it is supposed to look like that. *Trust* me. So, after "swimming" for an hour we transition upstairs to the cycle class. *After* we change, that is. A few weeks ago, we had a substitute. After the most unmotivating workout ever, it was time to stretch. We were told to put our pedals at 9 and 3. 9 and 3? ?Where the heck's 9 and 3?? Once the stretching was over, I noticed the clock on the wall directly across from me. I blame it on the reggae-induced confusion. So, that's our nice little Sunday. I'm workin' it out. But, I'm thinking I should get some Stickum . I could really use some for my seat! 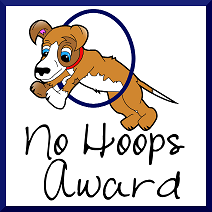 On a side note, I would like to thank Bernie over at One Mixed Bag for giving me the No Hoops Award! The best thing about it? No need to talk about yourself--just say thank you and move on! *HEY GUYS! THERE'S STILL TIME TO ENTER THE DRAWING FOR A DRAWING! JUST HEAD OVER TO THE LAST POST HERE. I WILL ANNOUNCE THE WINNER NEXT SATURDAY NIGHT! This one made me laugh out loud! Hey I'm catching up to you, I have done 4 spin classes now! It's still one of the hardest workouts ever, but I still keep going back and miss it when I don't. Question for you though, how do you breath when you "downhill" swim? Ooh cantilevering - what a fun word! Less fun are those climbs they make you do in spin class. I actually like the hand behind the back thing, because concentrating on my balance takes my mind off the pain in my thighs just a teensy bit. I'm so jealous of your weekend workouts with Dave! That's so fun! I always have a sore booty after cycle too. I don't know about reggae music either...it just doesn't seem right for the class.. I've just never been able to get into spinning classes. Ok, I only went once, BUT let's just say 5am and Peter Gabrielle are apparently not my thing. I love all the swimming "tips." It would drive me crazy, but all the pictorials of the tips are hilarious! "Steve" :P : Thank you. I have no idea how to breathe while swimming downhill. Know anyone who might have an answer?? MrsQ318: I agree; reggae's good for non-athletic endeavours. One lady in the class actually told the teacher she hoped it wasn't going to be the same 'smoke a doobie' music as he had played in his last class! KT80: I think any music at 5am that isn't intended to lull me back to sleep would be awful! Kurt: Thanks! It is a lot for my brain to focus on, but the info really is helpful! Robyn: Thanks for stopping by--glad you enjoyed the post! Ha! Reggae in a spin class, I don't know about that! And your swimming seems to be getting better :) lol. Hope you are having a great weekend, girl. Happy Comment Love Day! Awesome to see another follower of the swim and spin routine! It is tough, but good for you sticking with it! I can't even imagine how awful a reggae spin class would be. I think I might walk out, and I am NOT a QUITTER! I LOVE your posts. you always make me giggle! TexaGermaNadian: HA! I sense a wee bit of sarcasm in your swim compliment ;) Yes, it's been a nice, sunny weekend! Man I'm tired just looking at the pictures and reading this. You go girl. I'm so impressed that you are doing three things on a Sunday. Wow! I would be lucky to get one done. reggae in spin!?! yikes! way to hang in there! love all your pictures they are so funny! Bernie: Thanks! Technically we only do *two* things on sunday ;) But it's still exhausting! Holley: Thank you :) Yeah, reggae is not even my *last* choice for music for a high intensity class. SJ: Thank you so much! I'm glad you found it to fit with your hop! I just found your blog through Mingle Mondays, and I'm in love! Your drawings have lifted me up on a pretty negative day... not only that, but how you feel in swimming is how I feel in running... oy vey. So glad to have found you. As an ex-swimming instructor this made me laugh outloud. Love the drawings! I love your drawings! I would love to have something like this to print on shirts I sew. Your drawings are so cute and funny! You are so creative. I am so impressed with your athletic endeavors and that you draw about them. Visiting from the belated Mingle Monday. First, let me just say THANK YOU for all your nice comments! Jill: Well, I think that's one of the nicest things I've heard! I'm glad I could help brighten your day! Kristen: I've never thought about having my drawings on clothes! Laura: Glad you stopped by--I love Mingle Monday! New follower from FTLOB's Get Fit! Your writing and timing are FUN-NAY! And your illustrations?! OMG! HILARIOUS! I wish SO BADLY that we lived in the same city and then we could do this together. And by "we could do this together," I mean I would beg you to help me train for something other than Law & Order SVU marathons because, frankly, I'm already a pro at those. No big deal. PS: I feel like such a bad reader/commenter lately, ugh. But I love you! I think it's so great and inspirational that you have taken on such a challenge. I wish you luck. The biggest challege I have taken recently was learning how to drive stick shift. That worked out well, and I've been trying to find a new adventure myself. Chevon: Thanks! Stick shift is a big challenge too! I tried it a couple (ok 10) years ago. It did not go well. Good for you for mastering it! I love Spin class, but I hate spin class. I remember the first time my instructor told us to do the one handed no bounce. Um....lets just say there was still some bouncing going on. Sounds like you are working super hard! Your blog is so inspirational! andrea: see, we really are meant to be friends...law and order marathons are the best! (of course all the cool kids know that the original series is the BEST ONE). Honestly, i don't think i could muster this level of activity in the TX heat. And I would know. I lived there. Again, sorry this reply is so late but i just saw these comments!! The trendy spin craze wheels into San Diego with SparkCycle's pulsating music and dance-party vibe Spin Class San Diego.